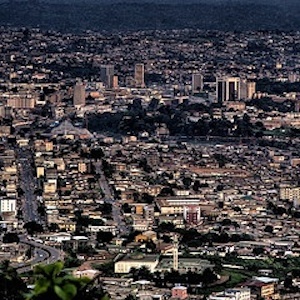 Yaoundé is the capital and second largest city of Cameroon. Georg Zenker, a German scientist, led a group of people who settled Yaoundé in 1888. Yaoundé is located in the Ewondo region between the Nyong and Sanaga rivers in southern Cameroon. In 2012 an estimated 2.4 million people resided in Yaoundé. Cameroon emerged as a major source of the slave trade in the sixteenth century. The Portuguese, British, French, Dutch, and Americans were heavily active in the New World trade along the coast. The Transatlantic Slave Trade was abolished in the 1800s, but European countries remained active in Africa. On the eve of the Partition of Africa Gustav Nachtigal, a German diplomat, signed a treaty with two Duala chiefs in 1884 that led to the establishment of German Kamerun. In 1909, Yaoundé became the capital of German Kamerun. During World War I, British, French, and Belgian troops invaded German Kamerun. Belgian troops occupied Yaoundé throughout the war. Following the end of World War I, the League of Nations divided Kamerun, giving the British control of the eastern territory and the French control of the remainder of the territory. Yaoundé became the capital of French Cameroun. Infrastructure investments such as road and railway projects connected Yaoundé to Douala, the largest city in French Cameroun, and the northern region of the territory. Following World War II, nationalism emerged in British Cameroons and French Cameroun. Nationalists formed the socialist Union des Populations du Cameroun (UPC) in 1948. The UPC called for independence from Great Britain and France and reunification of the two territories. On January 1, 1960 France granted independence to French Cameroun. Ahmadou Ahidjo became the first president of the Republic of Cameroon. In 1961, President Ahidjo reunified British Cameroons with the Republic and Yaoundé became the capital of independent Cameroon. Ahidjo centralized political authority in Yaoundé. The capital’s population grew from 100,000 in 1960 to 314,000 in 1976. The University of Yaoundé opened in 1962. The 1972 centralization of government functions led to growth and a diverse population in Yaoundé. The capital’s major ethnic groups include the Fulani and Bamiléké. The government and civil service are the central industries in Yaoundé. Agriculture, manufacturing, and several research centers also play a vital role in the Yaoundé economy. Ahidjo served as president for 22 years and resigned in 1982. Paul Biya became the president of Cameroon in November 1982 and remains in power. Mark W. DeLancey and H. Mbella Mokeba, Historical Dictionary of the Republic of Cameroon (Metuchen, NJ and London: The Scarecrow Press, Inc., 1990); Eric Young, “Ahidjo, El Hajj Ahmadou”; “Biya, Paul”; “Cameroon”; “Yaoundé, Cameroon” all in Africana: The Encyclopedia of the African and African American Experience 2nd Edition, editors Kwame Anthony Appiah and Henry Louis Gates, Jr. (New York, Oxford University Press, 2005).